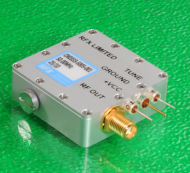 As the requirement for highly stable, low phase noise, crystal product pushes ever higher in frequency, RFX have worked to push their TA364 package to above 2 GHz. Key in the design has been to maintain excellent phase noise capability with tight frequency control range, targeting temperature stabilities of up to half a part per million on commercial ranges with targeted phase noise of better than -110 dBc at 1 KHz offset. The SMA output of the TA364 package leads to repeatable and stable connection capability with good fifty ohm matching. The employed design method is detailed in the article below. Fundamental crystals can now be manufactured through inverted mesa designs to frequencies around 1 GHz. However, for applications requiring the stability of a crystal oscillator above 2 GHz, overtone designs or frequency multiplication are the only options. Where stabilities of better than 1 ppm are required, overtone designs become impractical due to the high Q and lack of tune range. This leaves frequency multiplication, often achieved through phase locked loop locking techniques; when a lower frequency crystal oscillator is locked to a higher frequency voltage controlled oscillator through an analogue phase locked loop. In some applications phase locked loops are not practical, maybe because the degradation in phase noise at the loop corner frequency is unacceptable or perhaps the loop delay lock time is unacceptable. The option then narrows to harmonic multiplication of a lower frequency crystal oscillator. It might seem intuitive to start with a frequency as high as possible so that there is the minimum of harmonic content generated in the multiplication process, such as starting with a 1GHz crystal when requiring a 2 GHz output. This would be acceptable if long term stability issues such as ageing were not an issue, but as the rate of ageing increases the thinner the crystal becomes. A 1 GHz crystal will have a first year ageing rate of several parts per million. A good compromise would be to start with a 250 MHz crystal and multiply harmonically by eight. Although this complicates the harmonic generator and required harmonic filter the ageing rate can now be held to a couple of parts per million in the first year and the long term stability of the oscillator is greatly improved. A 250 MHz crystal oscillator needs careful design consideration as the drive level in the crystal has to be sufficient for good phase noise performance of the oscillator, but not so high as to cause long term ageing issues. In addition, if the oscillator is to be temperature compensated the drive level on inverted mesa crystals has to ensure that no significant RF heat is applied to the crystal blank as this can cause both compensation and phase noise issues. It should also be noted that phase noise at the output of the multiplied design will degrade by 20log(n) dB where n is the multiplication factor. For an eight times multiplier the phase noise degradation will be 18 dB across the range.